False outrage is the name of the game when you're a Kansas teacher. At one point, I was keeping a list of all their grievances, and then I decided I should spend at least a tiny percent of my spare time doing something useful. They're all angered up today because a Senate committee approved a bill that would disallow the practice of payroll deduction for union dues. 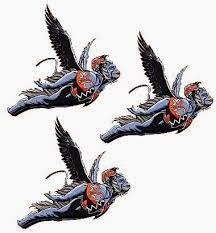 Cue the flying monkeys. The Kansas Legislature must be stopped, because they're trying to make it so union members have to WRITE THEIR OWN CHECKS TO PAY MEMBERSHIP DUES. As a matter of principal, I pretty much hate all payroll deductions. It makes us all a little lazy about how our money is spent, who spends it, what it does for us. If the federal government goofed and went one full month without taking Social Security, Medicare, Income taxes etc., from everyone's paychecks, I am convinced the screaming to eliminate or reduce those programs would be intense. People don't realize how much money is absconded from their paychecks, and because they never miss what they're paying into the programs, they pay little attention how the money is used. Let's just call disallowing a payroll deduction a TEACHING MOMENT. I thought teachers loved teachable moments. Well, now you may get one. How awesome. The way the squawkers are billing the change is so laughable. The naysayers argue that the legislation is stripping "Kansas public employees of the right to control their own paychecks..." Um no. You can still send a check to the union. The legislation won't stop you. Send double if you want. These dumb-dumbs screaming their bloody heads off are TEACHING your children. The message they're sending: We can't handle our own finances. We can't handle the responsibility of joining an organization and paying our dues without our employer (the state/slave master) doing it for us. Healthy message, teachers unions. Super reasonable. I've just downloaded iStripper, so I can have the sexiest virtual strippers on my desktop.